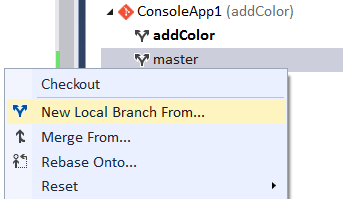 Yesterday’s tip visualized what happens in Visual Studio (and in Git) when you create a branch. 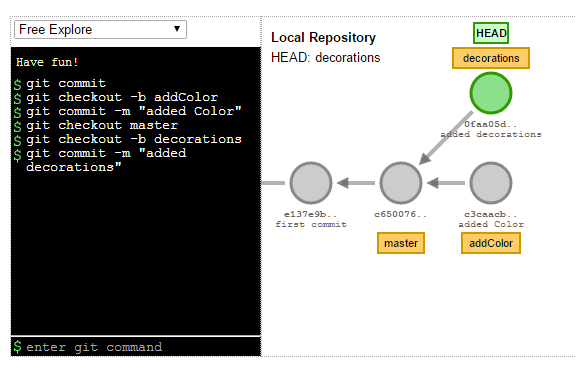 Today’s tip visualizes committing code independently in different branches. 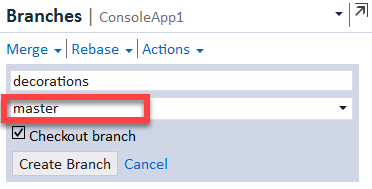 First, you’ll see how to commit to separate branches in Visual Studio, then we’ll rinse and repeat in the Git Visualization tool. In this example, I’ve rolled back to the Console Application with only output message. 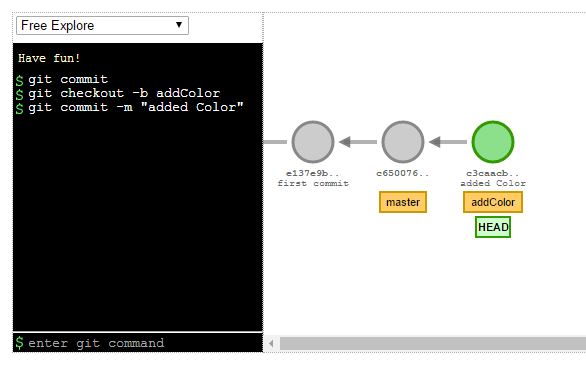 We’re going to add the ChangeColor() method and call on a branch called addColor. Once you’ve pressed Commit All to addColor, you’re going to discover that you want to experiment with decorations. 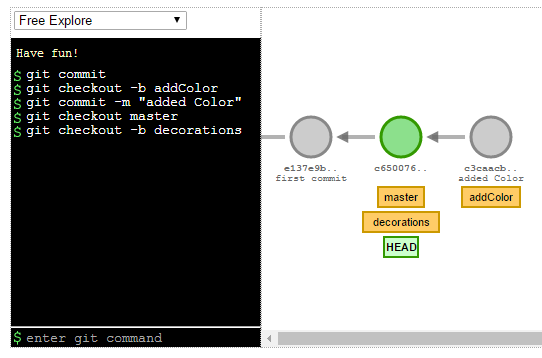 You can use Team Explorer – branches to create a new branch called decorations. 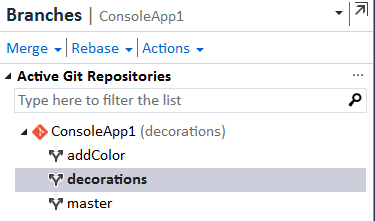 You’ll want to use master because you want to keep the addColor changes separate from your decorations branches. And now commit those changes to your decorations branch. First, we’ll want to create and checkout a branch called addColor and make some changes there. Next, we’ll want to switch back to master and create a new branch from there. 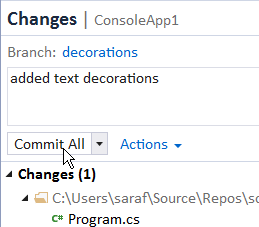 Finally, we’ll make a commit on the decorations branch. I keep trying to remind myself that whenever I do a checkout, reset, etc. I’m not really going forward and backward in time, but rather I’m moving to a different nodes on a graph. Visualizing what git is doing helps break my timeline mental model. What is the name of application you use to show graphical changes in screens above? The tool I am using is http://git-school.github.io/visualizing-git/ I need to post a widget on the side of my blog with a link to it. Hello Sarah, this series about git are awesome. 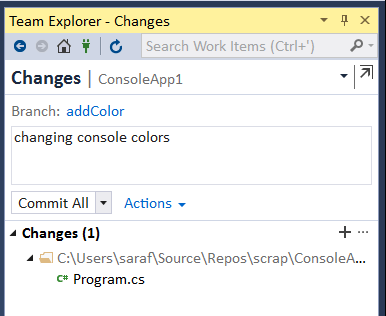 Do you know if it’s possible to use a commit template inside visual studio? No idea! 🙂 But if I find out there is one, I’ll add it to the series. Thanks for the question!